Father Michael Driscoll is the 36-year-old priest at a Spanish mission church in the Papago Indian community south of Tucson, Arizona, when he receives an urgent message to return to Dublin to help an ex-lover who told him that her life was in danger. He is an unscrupulous character who does not hesitate to help himself to the contents of his church collection box to help pay for his journey - or rob a friend when he needs the money. Before joining the church, he had been an undercover detective with the Boston Police Department, and he still proves to be a tough and determined fighter "even if it meant bending a few rules, maybe even breaking the law". He explains that he had become a priest because "working as a detective gave me a new perspective on life and death. I finally acknowledged to myself that I was a deeply spiritual person and was drawn back to the Church .... No, it was more powerful than that. I felt compelled to a vacation in the Church." But though he turns out to be an excellent sailor (so accomplished, in fact, that it is not easy to believe all that he is able to do) and is an aggressive tough guy, he does not make a very convincing clergyman. Indeed at one stage "he tore the clerical collar from his shirt and threw it into the river .... Better a cop than a priest to solve a murder and find a missing child, right? .... Free from his clerical collar and black suit, he looked at the world through different eyes. He felt like a wholly different person, better than his old self, better even than his priest self." He is a singularly unattractive character, and makes a most unclerical detective. 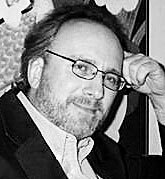 David Compton was born in Atlanta, Georgia, and was a marketing executive with several Fortune 500 companies before becoming a writer. He then moved to Oxford, Mississipd. His first spy novel, The Acolyte, became a bestseller and was made into a movie called Executive Sanction. He is currently living in Europe with his family where he is busy writing. 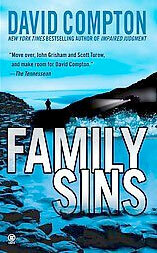 Family Sins tells how, when a former lover is murdered, Father Michael Driscoll's shady past casts suspicion on him. His consequent hunt for the killer places him in the middle of a deadly power struggle as the Irish and American sides of his major crime family unite to wreak a multimillion-dollar Powerball pay off based on their discovery of a security flaw in the system's computer program one. it makes an extremely violent and unengaging story with its murderous in-family drug dealing, murdering, and feuding, and too many of the characters are thoroughly unpleasant. The author has his own simple website. Inexpensive used copies of the book are readily available. The significance of the cover is not immediately apparent.